Hyderabad, 28th August 2016: Citizens came out in large numbers to cheer over 16,000 runners participating in the 6th Edition of Airtel Hyderabad Marathon. 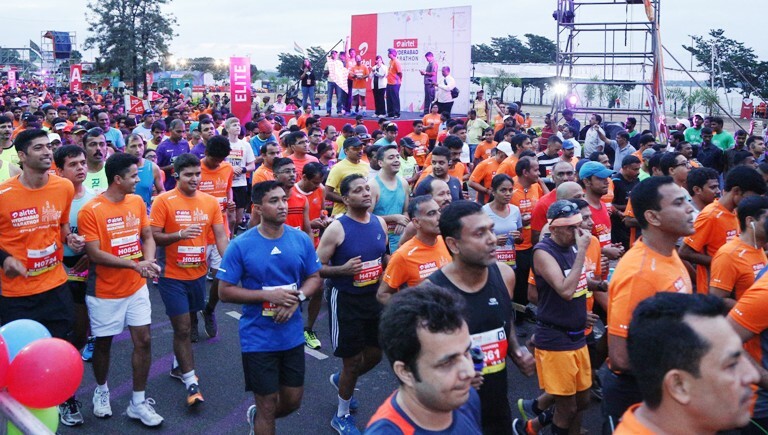 Over 50 music bands and large scale entertainment kept the runners spirit high while sports enthusiasts and thousands of citizens lined the entire route to participate in the city's largest community sporting event - Airtel Hyderabad Marathon 2016. 1000 runners participated in the Full Marathon flagged off by Shri Jitender, IPS, Additional CP (Traffic) and 5000 runners in the Half Marathon flagged off by Shri Dr. B. Janardhan Reddy, IAS, Commissioner - GHMC at People's Plaza. Over 5000 runners participated in the 10K Run flagged off by Shri Naveen Chand, IPS, Commissioner of Police - Cyberabad (West Zone) flagged off the 10K Run today in the presence of dignitaries from the Government, Corporate houses and the organising team from Hyderabad Runners Society. 5000 runners participated in 5K Fun Run on Saturday, August 27. Hyderabad Runners Society accords highest priority to runners' safety and Care Hospitals is providing 250 paramedics across 21 medical stations with 5 fully equipped ambulances and 15-bed emergency setup at Gachibowli Stadium. It also acknowledges the active support of Govt. of Telangana, sponsors, partners and over 3500 volunteers for smooth execution of Airtel Hyderabad Marathon and make it a grand success. Airtel Hyderabad Marathon has now become synonymous with many things which are Hyderabadi. It owes the current status to the vision, passion and hard work of the members of Hyderabad Runners, the team that had introduced this mammoth racing extravaganza to the city of Hyderabad. Founded in 2007, a good four years before the Marathon began to run across Hyderabad, the group currently has around 3600 members. Their mission is to promote active lifestyles amongst the public and make running as the preferred form of fitness activity in and around the twin cities of Hyderabad and Secunderabad.